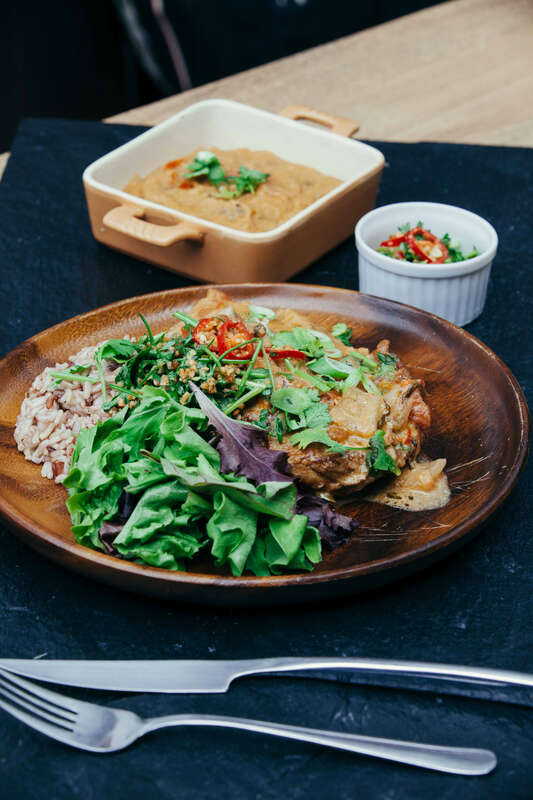 A Brazilian classic from the region of Espírito Santo, this chicken moqueca imparts the intensity and flavours from the spices and is recommended to be finished with the sweet scent of coconut cream. Don’t miss this! 1.Wash and pat dry the chicken. Season the chicken with 1 tsp salt and 1 tsp paprika powder. Add 1 tbsp of olive oil. Rub the chicken to ensure even distribution. Set aside and marinade for at least 1 hour or overnight in the fridge. 2.Heat 2 tbsp of olive oil in a pan or until the pan is covered with a thin layer of oil. Sear the chicken pieces skin side down and brown lightly over a medium heat for 3 min on each side till lightly brown. Transfer the chicken to a plate to rest and cover with aluminium foil. 3.Using the same pan, add the onions. Sauté on low heat till the onions are soft and translucent. Try to scrape the brown bits off at the bot-tom of the pan. Add the chopped tomatoes, stir. Simmer on low heat, cover and stir occasionally. 4.Add juice from ½ lemon to the softened tomatoes. Add 1 tbsp paprika powder to the mixture. Continue stirring. Add the chilli slices, ½ the chopped coriander and spring onion. Stir until well combined. 5.Add the seared chicken pieces and any remaining juices to the pan. Season the mixture with 1 tsp salt. Simmer covered on low heat for 10 min, stirring occasionally. Add the remainder of the coriander and spring onion onto the chicken and cover. 6.At this time, the tomato onion mixture would have released its juices. Scoop 500ml of juices into another pot to make the pirão. 7.Check that the chicken pieces are cooked through. Taste and adjust seasoning if required. Cover and let it simmer slowly in the tomato onion mixture while cooking the pirão. 8.Optional: Add 100-200ml of coconut cream to the moqueca for a creamy ﬁnish. 9.Otherwise, just top with chopped chillies, spring onion and coriander to ﬁnish. 1.Pour the juices collected from the moqueca into a pot and add a pinch of sweet paprika. Over a low heat, add 60g semolina ﬂour and stir constantly till the semolina ﬂour is cooked through. 2.The mixture would thicken into a paste-like consistency. 3.Serve with moqueca while it is still hot. 1.Combine the ingredients and mix well.